Groningen is the largest city in the northern region of the Netherlands. With 57 percent of all trips in the city made by bike, it has acquired the title "World Cycling City." In Groningen, even the large multi-lane roads have been tamed for safe cycling. At this intersection on the main ring road around Groningen, cyclists get their own green phase. When the bike signal says go, cyclists at any point in the junction can travel in any direction, including diagonally. Engineer Hillie Talens explains how it works in this short video, which kicks off a series of Streetfilms we made on trip to the Netherlands with a delegation from Bikes Belong. Posted in Bicycles. Tagged as Bikes Belong, biking, Dutch, green phase, Groningen, Hillie Talens, intersection, Netherlands, scramble. I always wondered if it would work out if the bikes could just go however they choose. Now I know. I have to admit I have never been as scared on a bike as I was when trying to cross an intersection for the first time in Groningen. I wasn't there long, but I rode through town, found it to be bike heaven. Awesome. It looks insane, but proves that bikes and peds going through lights are able to maneuver, stop, etc. and are essentially not dangerous. Not a helmet to be seen. A few hats and a couple shaved heads, is all. 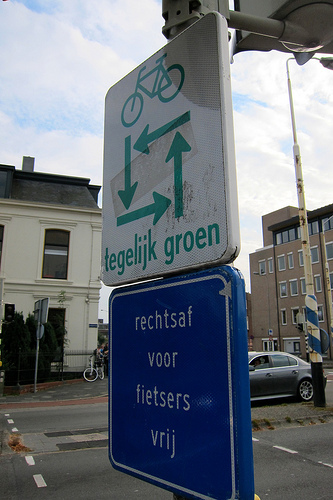 Having lived in Groningen, I can tell you that the 4-way green light for bicyclists sort of works. But only if everyone goes slowly and yields to those on the right. Before I got the hang of it, I missed many traffic light cycles while more aggressive riders cut me off. I wouldn't like to ride a bike there, I think there would be a great chance of colliding with another cyclist. I don't like this. The reason, is that this does not meet the 8-80 standard for bicycling. I would not let my kid bike through there, and I would imagine grandparents are scared to bike through there, making this a barrier instead of a connection. In the video, which is certainly not a complete cross-section, there are very few children and older folks. I for one would be willing to wait longer in order to ensure that the less aggressive cyclists can get through. The Dutch have done many great things which we should strive to replicate, but I'm afraid this isn't one of them. The majority of Dutch cyclists don't wear helmets. So what's your conclusion? Does it work or not work? A great city. Do visit if you have the chance! Honestly, that looks a bit too chaotic. There's no scaredy cat like me, and I cycle Groningen daily. This busy corner is not bad at all: if you want to experience fear, try Ebbingestraat. (Just kidding - I'm used to it now). It really is organized, and it's not much different than walking along a busy sidewalk. I've not yet cycled there, but I don't see why it would be much of an issue. As long as the cyclist all have a little bit of courtesy and aren't racing through like one would in a road bike race (which no one is doing in the video) then the occasional negotiation would be all that is required. Looks a little chaotic, yes. But as living beings, we're suppose to have a little bit of chaos in our lives every now and then. We've relegated ourselves to way too many regulations and have subjected our lives to conforming to things that weren't mean to be. If there weren't cars in the equation of our cities, then every intersection could in theory be like this one, minus the stop lights. I like the general idea, but this application looks carefully designed to facilitate bicycle collisions. I recently saw on a transit blog a design where they basically converted the bicycle transit through the intersection into a roundabout, which might be a better approach for this intersection. Give it green all ways, but let the left-turns go wide around the intersection and merge right as opposed to negotiating 90-degree interactions. This is great! It just shows bicyclists have much more in common with pedestrians than they do with cars. On a bike you can talk to each other, people are close to you. You really don't have that personal interaction when you're a motorist or when motorists interact with bicyclists or pedestrians. People need to get out of the box and experience other people. It's good for them and their community. How do you know many children or older people use this from a 45 second video? Do you have any data? I accept that it feels unsafe, but 1 - People can see who is coming and 2 - You should try it before you condemn it. In the USA or Canada context one just needs to find two intersecting streets with heavy - put perhaps not too heavy - bicycle traffic and do a pilot project. @Green_Idea_Factory:disqus I'd love to go try it, and certainly will the next time I'm in Gronigen. Obviously, my point about not seeing many kids and old folks is not based on anything but the video, so there is no data behind it. My impression still remains that this looks scary, and does not seem like something that I'd want an 8 year old to bike through. So I'm skeptical, but who knows. Maybe I'll have a different impression after trying it. I should also mention that this treatment would likely feel much more comfortable with a lower volume of bicycles. The other videos you linked to show such a situation, and it appears to be much easier to navigate. Perhaps the incredibly high volume of bicycles (rush hour?) is the reason it looks scary in this video. Simpoly because they are no more necessary for riding a bike than for walking. No helmets, and they have about the safest cycling environment anywhere: far more than North America, Australia or Britain with their helmet fetish and refusal to provide proper safe infrastructure for biking. It might look dangerous but how dangerous is it really? San Francisco has 4 way pedestrian crossing and bicycles use it, too. We just slow down a bit. Many bicyclists don't wait for the long red lights at four way light traffic intersections and "run the light". In contrast the depicted bicycle-only four way simultaneous crossing looks safer than running red lights. Excuse me but, where are the pedestrians crossing? Saw only 1 and half (a skateboarder at the beggining). How do you think this could work in a more walked area? The pedestrian crossings would be further back from the intersection. I don't know the rules for skateboarders in Holland, but pedestrians would not be crossing in the bike lane because that is strictly only for peds. *sorry for the typo. Meant, strictly only for bikes. I first visited the Netherlands well over 30 years ago and was amazed at the use and popularity of bicycles in all weathers and by all sorts and ages. 30 plus years later here in Liverpool, UK we are still a million miles from where the Netherlands was all those years ago. I know there are lots of people here trying to champion the use of bicycles for short journeys and that the government are trying their best to promote bike use but it's awfully slow in coming. No infrastructure appears to being planned or created added to which there seems to be a wide-spread antipathy towards cyclists by almost all UK car drivers. It must be wonderful to live in towns such as Gronningen, Amsterdam and other Dutch towns and cities and have the opportunity to choose to cycle rather than drive. Pedestrians have their own green lights for crossing streets, you push a button and wait for your light. Simple. A skateboarder is considered to be a pedestrian by Dutch traffic law. I live in Groningen. Doesn't look like rush hour to me, that crossing is always that busy. And no, it's not scary. You won't get run over, there's plenty of space. Actually, there is more something like a silent agreement. When the light turns green, you start crossing and you wait on the other side of the junction for the cyclists from the right. As such you have already crossed most of the junction before you have to stop. The implementation I think you are talking about is the pedestrian crossing in LA. The Dutch intersection had no markings in the middle of the intersection. This is like so that cyclists can follow their desire lines through the intersection, and not have to worry about cycling through marked lanes. I was under the impression that these were actually invented in Enschede, not Groningen. I believe Enschede has worked to fix some of the problems their cycling situation had at the time, and is continuing to do so.